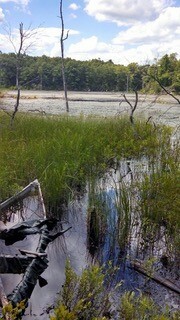 This 1.8 mile trail is located in a 43 acre- forest owned by DEEP with a large pond in the Menunketeseck-Cockaponset Greenway in the Little City section of town. Two years ago, Erin Moriarty, an H-K HS Class of 2009 alum began a campaign to have the State consider purchasing the land as a preserve. The Kuiaski Property Estate was then on the market for $300,000 to be sold as building lots. 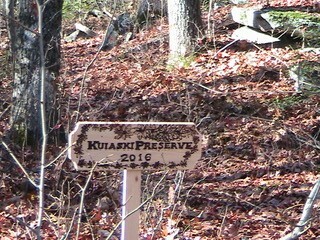 Moriarty, who lives in Burlington, Vermont, set up Friends of Kuiaski Estate Property Preservation https://www.facebook.com/higganumwoods on Facebook to rally supporters. The trailhead is in the Reisman Trail cul de sac in Higganum with parking available there. There is a small wooden sign, “Kuiaski Reserve” at the head. The trail is marked by yellow blazes on trees. 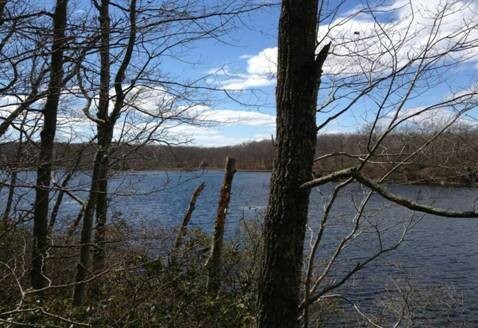 There is a very secluded lake about 1.4 miles out. The total walk the pond and back is about 1.8 miles on a curvy path, some of it narrow, but mostly wide. For a Downloadable Trail Map PDF of this trail with roads, click here.